Heat Exchangers | Valutech Inc. If you work with a chemical, electronic or mechanical system where heat is transferred from one place to another, a heat exchanger is the best way to optimize that process. Our suppliers include Alfa Laval, SGL Group who specialize in graphite heat exchangers, and for shell and tube, as well as shell and coil heat exchangers. 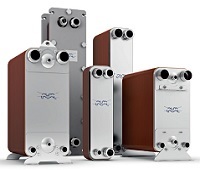 As exclusive Ontario representatives of Alfa Laval plate heat exchangers, we provide solutions for solving Alfa Laval heat transfer problems. A heat exchanger is a device for transferring heat from one medium to another. It does this in several ways, each of which has its own advantages and drawbacks. In each and every case, the transfer of heat takes place even though the two mediums never mix with one another. In a typical heat exchanger, one medium, i.e., water, enters the heat exchanger at a certain place at a certain temperature. The other medium, also water, enters the heat exchanger from a different location at a different temperature than the first. Regardless of what function the heat exchanger fulfills, in order to transfer heat, the fluids involved must be at different temperatures and they must come into thermal contact. And in accordance with the second law of thermodynamics, heat cannot of itself pass from a colder body to a hotter body. It will always move from the hotter to the cooler medium. Whether you want to heat a fluid using a hotter fluid, reduce the temperature of a fluid using a cooler fluid, heat pool water using solar heat, condense a gaseous fluid using a cooler fluid or boil water while condensing a hotter gaseous fluid, the right heat exchanger will help you to do this more efficiently. To pick the right heat exchanger for your application, you will need to know what kind of heat exchanger is needed. Heat exchangers are classified according to their flow pattern and their construction. Construction: heat exchangers are most often classified by their construction. Two of the most popular types of heat exchangers are the shell and tube and the plate heat exchanger. Using corrugated plates mounted and fastened together within a frame, plate heat exchangers are ideal for applications where temperature and pressure demands are not that high and there is very little particle debris or build-up in the fluid. There are several variations of the plate heat exchanger including gasketed plate and frame, brazed heat exchangers, welded plate, and semi-welded plate heat exchangers which are differentiated in terms of how the plates are fastened together, i.e., with welds, gaskets or by vacuum brazing. Variations of the plate heat exchanger include brazed, gasketed, semi-welded and welded plate exchangers. Consisting of stainless steel tubes inside a carbon steel shell, shell and tube heat exchangers are ideal for applications with extremely high flow rates, temperatures and pressure loads. They are also come highly recommended for handling contaminated liquids with particles that would normally block the channels of a plate heat exchanger. Variations of the shell and tube include U-tube, straight, shell and coil, spiral tube heat exchangers, and finned tube designs. *A new form of heat exchanger includes the shell and plate heat exchanger which consists of a shell that contains plates instead of tubes. Flow Pattern: There are three typical flow arrangements to consider: parallel, counter and cross flow. Parallel and counter flow patterns are both in line flow patterns: two fluid streams flow in the same direction or in the opposite directions. In this heat exchanger, two fluids enter the exchanger at the same end, and travel in parallel to one another in the same direction to the other side. In this case, the two fluids enter the unit from the same end with a large temperature difference. As the fluids transfer heat from the hotter fluid to the cooler one, their temperatures start to approach one another. In this heat exchanger, two fluids enter the unit from opposite directions and travel against one another. Because the cooler fluid exits the counter flow heat exchanger at the end where the hot fluid enters the heat exchanger, the cooler fluid will approach the inlet temperature of the hot fluid. Counter flow heat exchangers are the most efficient of the three types. In contrast to the parallel flow heat exchanger, the counter flow heat exchanger can have the hottest cold fluid temperature greater than the coldest-hot fluid temperature. In this heat exchangers, the fluids travel perpendicular to one another through the exchanger, i.e., one fluid flows through tubes and the second fluid passes around the tubes at 90° angle. These units are usually found in applications where one of the fluids changes state. An example is a steam system’s condenser, where the steam exiting the turbine enters the condenser shell side, and the cool water flowing in the tubes absorbs the heat from the steam, condensing it into water. While the fluids in a shell and tube heat exchanger are separated by a series of finned tubes, the fluids in a plate heat exchanger are separated by plates with very large surface area. This plate type arrangement is more efficient than the shell and tube and is mostly used when temperature and pressure demands are not that great. Its only weakness is the gaskets themselves. Advances in gasket technology, however, have made the plate type increasingly practical. When it comes to flow arrangements, all three flow patters have their advantages and disadvantages. But of the three, the counter flow design is the most efficient when comparing heat transfer rate per unit surface area. Fouling – one of the most serious problems that you will face with heat exchangers is fouling. Whenever you use a natural source of water as your cooling medium, i.e., lake, a lot of biological and human debris will enter the heat exchanger and build layers, decreasing the heat transfer coefficient. Scale – another possible problem is scale, which is chemical deposit layers such as calcium carbonate or magnesium carbonate. Plate heat exchangers need to be taken apart to be cleaned, while shell and tube heat exchangers can be cleaned using acid, bullet cleaning etc. In a large scale operation, water treatment such as purification, addition of chemicals, and testing, can minimize fouling. Corrosion – is a never-ending problem that is solved to some degree by the type of material used to make the heat exchanger. Heat exchangers are typically made from steel, titanium, copper, bronze, stainless steel, aluminum or cast iron. Those made with stainless steel are usually the most corrosion resistant. It is important, however, that the grade of stainless steel be capable of handling the environment in which the heat exchanger operates. Defined as a ferrous alloy with a minimum of 10.5% chromium content, stainless steel has higher resistance to oxidation (rust) and corrosion in most environments. To avoid corrosion, pitting, stress-corrosion cracking (SCC), and other failures, some heat exchangers are designed with fins to provide greater thermal conductivity.